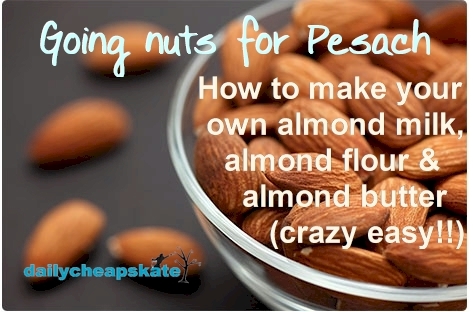 Daily Cheapskate: Going nuts for Pesach: how to make almond milk, almond flour and almond butter. SO EASY! Going nuts for Pesach: how to make almond milk, almond flour and almond butter. SO EASY! UPDATE: I'm bumping up this post from last year to the top of the website. This is one of the best money-saving hacks you'll find for Passover shopping on almond products. So let me start out by confessing that I'm pretty uninspiring in the kitchen. I'm not one of those people who is constantly posting pictures of my amazing meals on Instagram because my meals are less than amazing and that's okay. I like simple, easy, healthy, inexpensive and tasty food and I constantly look for shortcuts. I like nice, not overblown, presentation. I don't like to spend hours in the kitchen cooking and baking. I'm never going to be Martha Stewart. So when I tell you that making your own KFP (kosher for Passover) almond milk, almond flour and almond butter is really, really easy, please believe it. If I can do it, so can you. You'll save money in the long run. You'll know exactly which ingredients are in your food. Have you ever seen the ingredients list for KFP coffee creamer? It reads like the stuff in a chemistry kit. The ingredients in almond milk? Almonds and water. Your food will taste less "Pesachdik." Compare the taste of a cake made with potato starch or matzoh meal to the taste of one made with homemade almond flour. The homemade almond stuff tastes really good. You will be 100% sure that your almond milk, almond flour, and almond butter are KFP and won't need to rely on various agencies' conflicting and confusing opinions, or worse yet, on Rabbi Internet. What you will need: a nut bag (like this one), a food processor (like this one), raw shelled almonds (I use the Costco brand, approved by the OU for Pesach), and water. Place the almonds in a bowl and cover with water. Soak the almonds for at least 12 hours, preferably overnight. Drain away the water and rinse the almonds. Combine the almonds and new hot water in a food processor. You can make the milk in any quantity that you like, with the water to almonds ratio as 3 to 1, or if you like thinner milk, 4 to 1. Blend at a high speed for 2 minutes. Store the almond milk in the refrigerator. It might separate in the fridge, so shake it up before using. It contains no preservatives, so it will stay about a week. Options: Add honey, salt and/or vanilla to the milk. What you will need: a food processor (like this one), raw shelled almonds (I use the Costco brand, approved by the OU for Pesach). Pulse the almonds in the food processor for about 2 minutes or more, until they turn into meal and then flour. Don't overprocess them or they will turn into almond butter. Store the almond flour in a tightly covered container in the pantry, refrigerator or freezer. The colder the storage, the longer the flour will last. What you will need: a food processor (like this one), raw shelled almonds (I use the Costco brand, approved by the OU for Pesach), and patience. Lots of patience. Don't overload your food processor bowl; fill it no more than halfway with almonds. Process the almonds on a high speed until they turn into meal, then flour, and then once the oils release, butter. Keep processing the almonds until the almond butter is smooth and creamy. In my food processor, this takes about 25 minutes. You need to be patient. It will look like crumbs, then flour, then suddenly, it's a butter consistency. Even after it becomes a butter, keep processing it until it's smooth. Just make sure your food processor motor doesn't get hot. If your nuts are giving you a hard time about becoming creamy, throw in a tiny bit of coconut oil to get the party started. Store the almond butter in a cool pantry, refrigerator or freezer. The colder the storage, the longer it will last. Almond butter will keep in the refrigerator for about two weeks and in the freezer for about 6 months. If the butter separates over time, just stir it. Options: Add salt, honey, or any flavorings. Add chopped almonds for a crunchy nut butter. Add other nuts. If you prefer, roast the almonds before processing them. FYI, this is one of my favorite crazyeasy, gluten-free, non-gebrokts, almond butter chocolate chip cookie recipes for Passover (6 ingredients, zero fuss).